If you take a look around in the freeware and Open Source scene you find many - and I really mean many - applications that automatically search for duplicate images on a hard drive. Many of these show comparison images of the image pairs that have been identified as duplicates and it is probably sufficient to use only one software for the task which means that if you already have a software you should probably stick to it. The only benefit from trying out a new software can be an increase in speed or detection rate. The functionality is more or less the same and can be broken down to finding duplicate images and giving the user options to react in certain ways, e.g. deleting, renaming, removing the duplicate images. 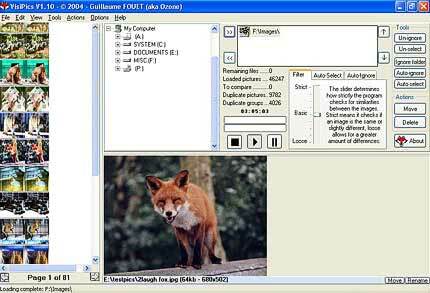 VisiPics is one of those applications that can detect duplicate images. It was developed to be capable of working with large image archives, the developers have tested it with an archive of 100.000 images that had a combined size of 15 Gigabytes. It offers dual core support, an efficient algorithm and smart automatic choices on numerous occasions. A slider determines how strictly the program should determine similarities between images offering a scale from loose to strict. The results are displayed during the scan which means that the user can start to manage them while the scan is still going on. The thumbnails of the detected duplicate images are displayed in the left pane. Hovering the mouse over an image displays the most relevant information including file size and resolution to the user making it easy to determine if the files are similar. It also displays a bigger picture of the image in the lower central pane. A left-click marks a file. Once all files have been marked they can either be deleted or moved by choosing the appropriate action in the Actions menu. A user has the choice to let the program determine the image that will be deleted and the image that will be kept. That's probably the best way of dealing with large image archives. It would simply take a very long time to check each image manually to determine if they are indeed similar and proceed with an appropriate action. The website is offering many details on the process, how the program is comparing images in a Wiki-like interface. The most commonly used image formats are supported by VisiPics including jpg, gif, bmp and png. Good program I used it numerous times. It may not be most user friendly (interface could be better) but it is very fast and efficient. Just tried it. Definitely fast and efficient. I don’t have a problem with the user interface, but than I’m used to lots of technical interfaces. This is definitely a keeper. Just a typo on “The developers”. VisiPics is the work of one individual.